If you have a condition that makes walking difficult, you will not find another mobility aid that matches the maneuverability, comfort, and portability of this scooter. You can maneuver in tight spaces such as a kitchen. 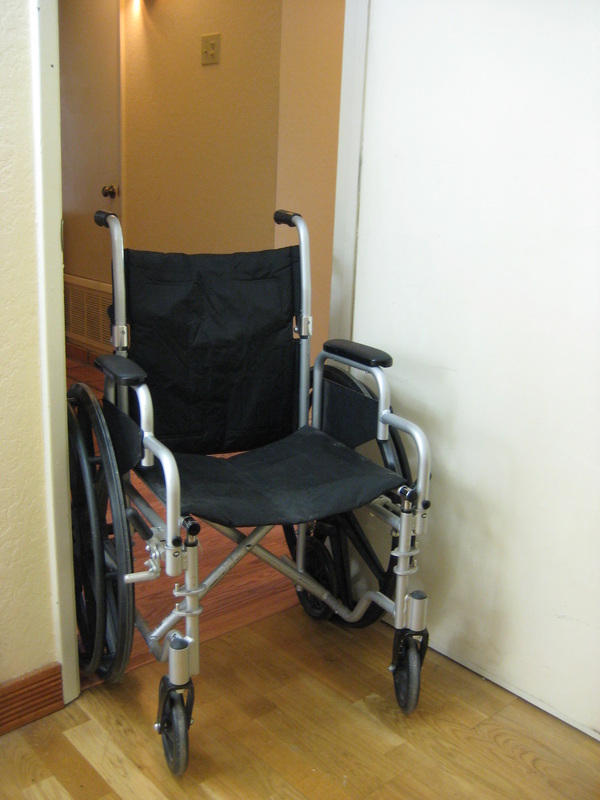 You can steer through doorways and around sharp corners that would be a tight fit for a wheelchair. The elevated seating position makes it more pleasant to carry on conversations with people who are standing, and makes it possible to reach top shelves. The scooter can be propelled with one foot and steered with one hand, unlike a manual wheelchair, which requires both hands for propulsion. You can maintain better back posture with the scooter instead of a wheelchair. The 12" pneumatic tires roll easily over uneven ground. You can even take the scooter on easy trails. Which one breezes through doorways? The scooter allows you to get up close to kitchen counters. Need to squeeze in between the fridge and center kitchen counter? No problem with the Walking Aid scooter. Before I designed the Walking Aid scooter, I was reduced to sitting on the floor to browse nuts and bolts at my favorite hardware store. My feet hurt to stand in line waiting to check out, so I had to kneel or sit on the floor there as well. The Walking Aid scooter has transformed my world. No more sitting on the floor because my feet hurt. Don't let foot problems keep you from getting out and enjoying life. 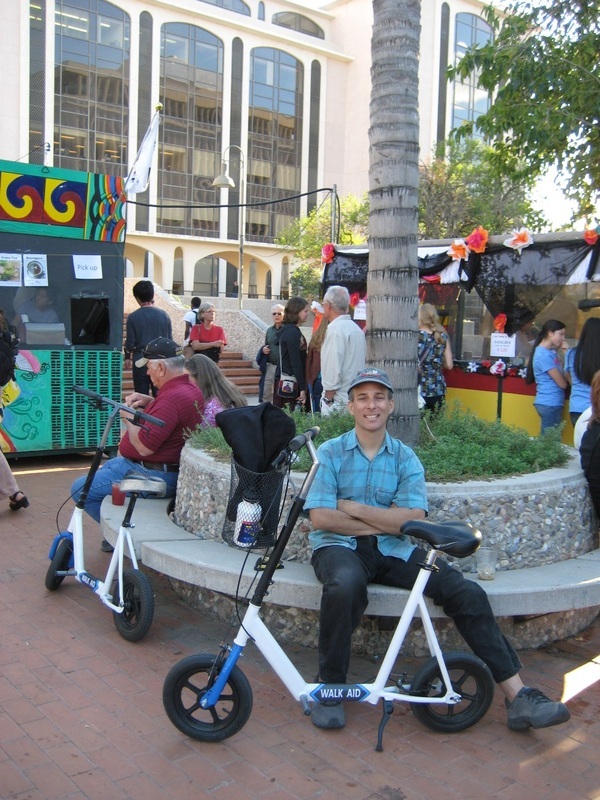 My wife and I cruised on our prototype Walking Aid scooters around a street fair in downtown Tucson. She is recovering from a Morton's neuroma in her left foot and can't walk much, so we scootered several miles to the event. The wide tires roll easily over uneven pavement and sidewalks. An early smaller prototype of the scooter.